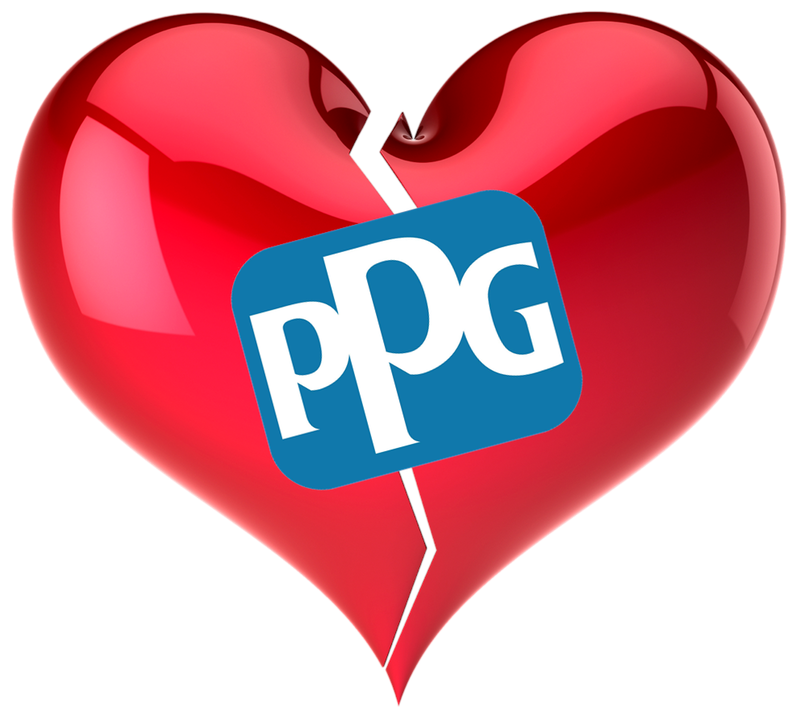 NO LOVE AT PPG INDUSTRIES — AM I NEXT? Pittsburgh, Pennsylvania-based PPG Industries, a Fortune 500 company and global supplier of paints, coatings, and specialty materials to industrial, commercial, and retail sectors, has announced further restructuring which will result in the loss of at least 1,000 positions. The layoffs were attributed to rising materials costs and the loss of a "major customer. "On April 23, 2018, PPG Industries, Inc. (the “Company”) approved a business restructuring plan which includes actions to reduce its global cost structure. The program is in response to a customer assortment change in our U.S. architectural coatings business during the first quarter 2018 and sustained elevated raw material inflation." "The program aims to further right-size employee headcount and production capacity in certain businesses based on current product demand, as well as reductions in various global functional and administrative costs." "A pre-tax restructuring charge of $80 million to $85 million, based on current exchange rates, will be recorded in PPG's second quarter 2018 financial results, of which about $75 million to $80 million represents employee severance and other cash costs. The remainder of the charge represents the write-down of certain assets and other non-cash costs. In addition, other cash costs of up to $35 million to $40 million will be incurred, consisting of incremental restructuring-related cash costs for certain items that are required to be expensed on an as-incurred basis of approximately $15 million and approximately $20 million to $25 million for items which are expected to be capitalized. The Company also expects approximately $15 million of incremental non-cash accelerated depreciation expense for certain assets due to their reduced expected asset life as a result of this program. Substantially all restructuring actions are expected to be complete by the end of the second quarter 2019 and will result in the net reduction of approximately 1,100 positions. The Company expects the cash payback of the restructuring program to be less than two years." "As previously disclosed on April 19, 2018, PPG received a report through its internal reporting system alleging violations of PPG’s accounting policies and procedures regarding the failure to accrue certain specified expenses in the first quarter of 2018. Based on its initial review at that time, PPG identified approximately $1.4 million of expenses (including legal fees, property taxes and performance-based compensation) that should have been accrued in the first quarter of 2018 and that were then reflected in PPG’s earnings for the quarter ended March 31, 2018 released on April 19, 2018. In addition, the report alleged that there may have been other unspecified expenses, potentially up to $5 million in the aggregate, that were improperly not accrued in the first quarter." "The Company is working diligently to complete its investigation, but is currently unable to predict the timing or outcome of the investigation. PPG has self-reported information concerning this investigation to the Securities and Exchange Commission. As a result of the ongoing investigation, PPG will not be able to file its Quarterly Report on Form 10-Q for the quarter ended March 31, 2018 by the deadline of May 10, 2018 and has filed a Form 12b-25 Notification of Late Filing. PPG is currently unable to predict when it will be able to file its Quarterly Report."